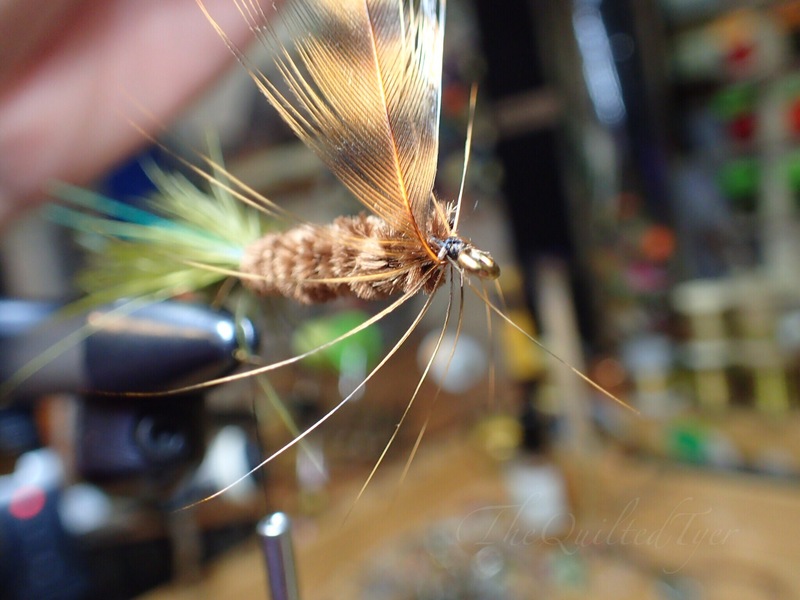 During our December 14th, 2016 PHWFF meeting we tied a Woolly Bugger that works great in low water, but if you missed it or you just need to brush up on some skills in regards to how to palmer a hackle back and bring the thread through the front, then this is the place for you! 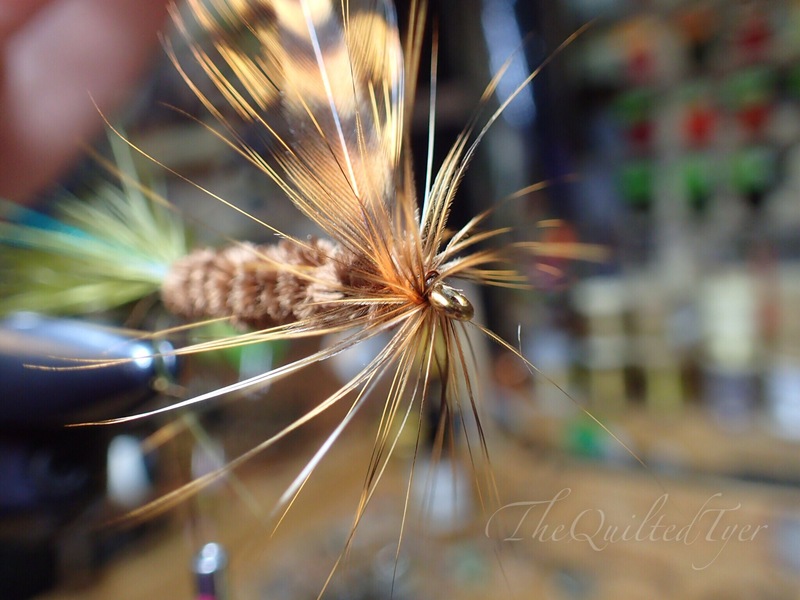 Start by grabbing your favorite wooly bugger hackle. Whiting bugger packs are a good investment. Whiting bugger packs are well worth stocking up on if you enjoy fishing and tying wooly buggers.They come in a wide variety of colors and each pack will tie a range of sizes. 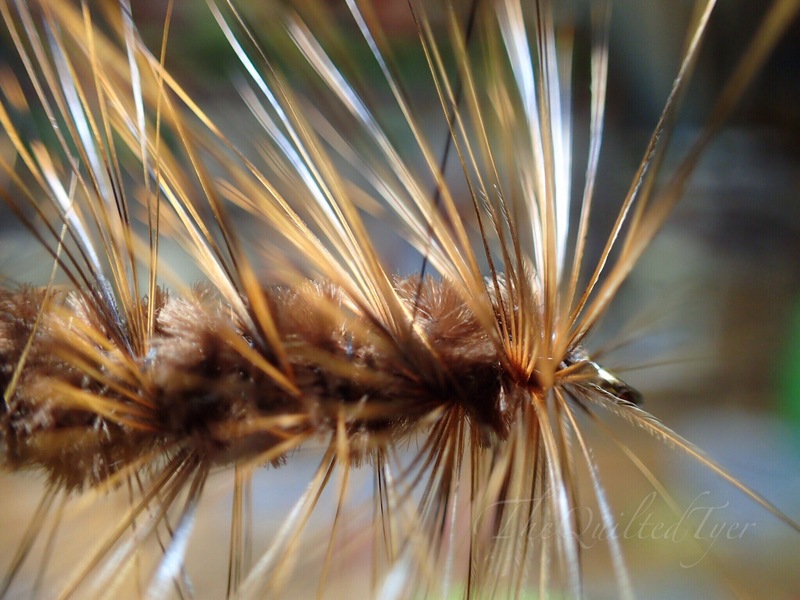 Grab your hackle and select one that has fibers which are just about twice as long.. as the width of your hook gap. The link will open in a new window so that you can continue here where you left off. When you are tying a fly whose hackle is tied in by the base of the stem, its a little different than when we do it by the tip. The base of the stem isn’t as flexible so you need to find the “sweet spot” so to speak, that will keep the feather from breaking. Everyone does this differently, but I will show you what works for me.I am going to use my Regal to demonstrate this (since I cant use two hands and take a photo at the same time ) What you want to do is hold the feather vertical by the stem in one hand(Regal) and then grab the tip of the feather in your other. Hold the feather by the stem in one hand and pull the tip down with the other. It will begin to bend very smoothly. Keep pulling with one hand while keeping the other steady, until the feather begins to pull from your fingers. What you want to see happen, is you want to have the half of the feather that’s in your stem hand, stay in the same spot as you pull straight down. Once it starts to bend, and begins to get pulled horizontal; is where you want to grab it with your fingers, because that is where its getting too thick and will snap when you try to wrap. Try it a few times to see what I mean, then grab the spot in your fingers. You may need to move the feather around in both hands a few times to see what I mean. But once you have grabbed the feather at the “cracking point” I call it you can get ready to prep the base. Grab it around the area that initially started to pull. Once you have the sweet spot marked with your fingers, strip the fibers off of either side of the stem just below the area in which you decided was the ‘sweet spot’. Start to strip the stem around where it began to pull, this can be adjusted so don’t worry. 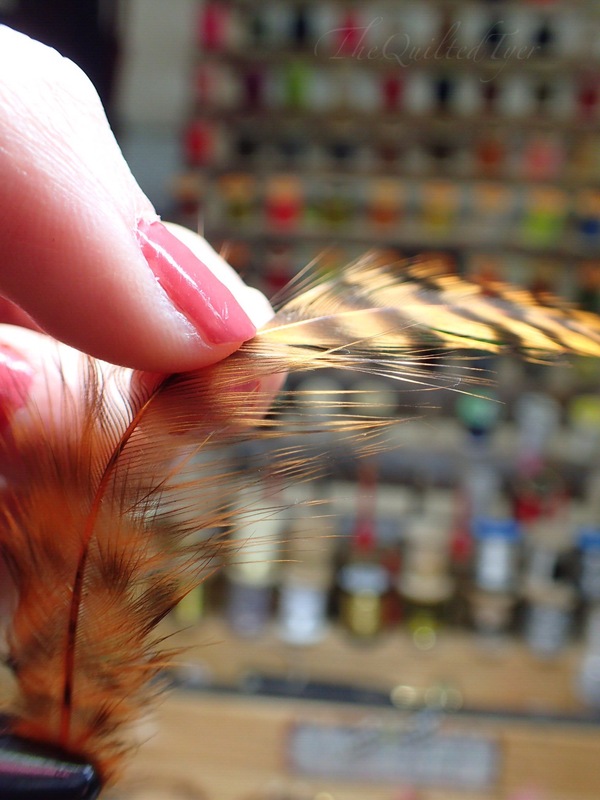 Next find the natural curve of the feather before tying it in, that is something we spoke about in the step-by-step on how to wrap a soft hackle. Once finding the natural curve, tie it in so that the concave side is over the hook. This way when you wrap it around it creates an umbrella when wrapped towards the bend. Grab your feather and hold it vertical by the stem. Take a look, then turn it the other way. Incorrect: Natural Curve pointing forward. Correct: Natural curve, with the concave side going over the hook shank. What you want to find before tying it in, is the natural curve. 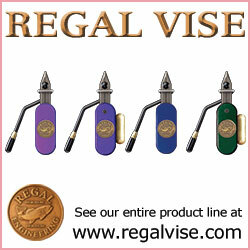 Which means you want the shiny side facing the hook eye; with the concave side facing the back of the hook. Doing so will allow the feathers to wrap the fly like an open umbrella. Once you have figured out placement, get ready to strip one side. Hold the feather with the concave side facing the back of the hook. Cut the excess off the stem. Now strip a few fibers from the stem on the side that will be laying ON the hook itself when it wrapped. The side that you want to strip these extra fibers from, will be the side that will be laying flat onto the hook when you wrap it around. Doing this will give you a clean start and reduce bulk at the head. 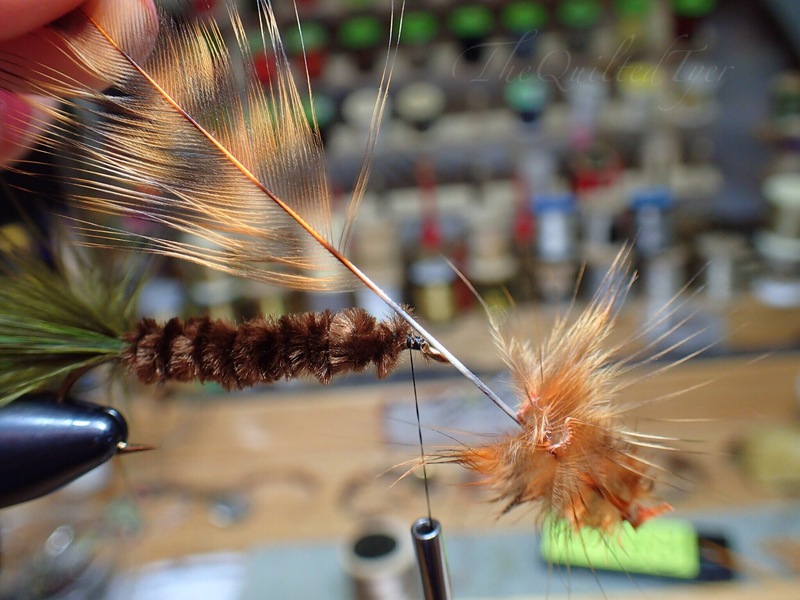 Now you can position your feather one hook eye length behind the eye and begin to tie it in. Do you see that little piece of stem that is sticking out? I recommend taking a wrap in front of it while pulling it back towards the hook bend and locking it in. This way it doesn’t end up inside your hook eye and blocking you from tying a fly on later, which… will happen more often than not if you leave it there. Now get ready to advance your thread to the back. This step will depend on your pattern. Some patterns may have wire already tied at the base instead of thread being used here, but nevertheless, this post is about the technique. 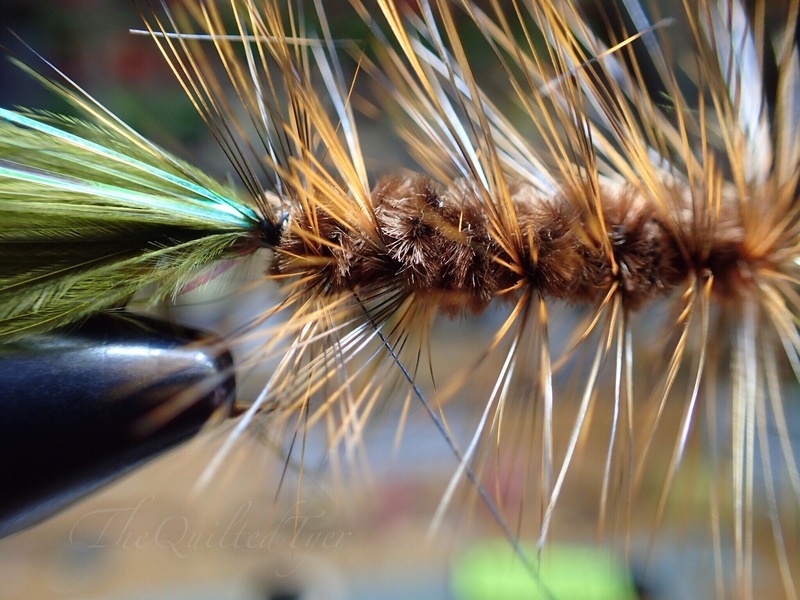 So once you have this down, you can tie a variety of flies in all different styles. 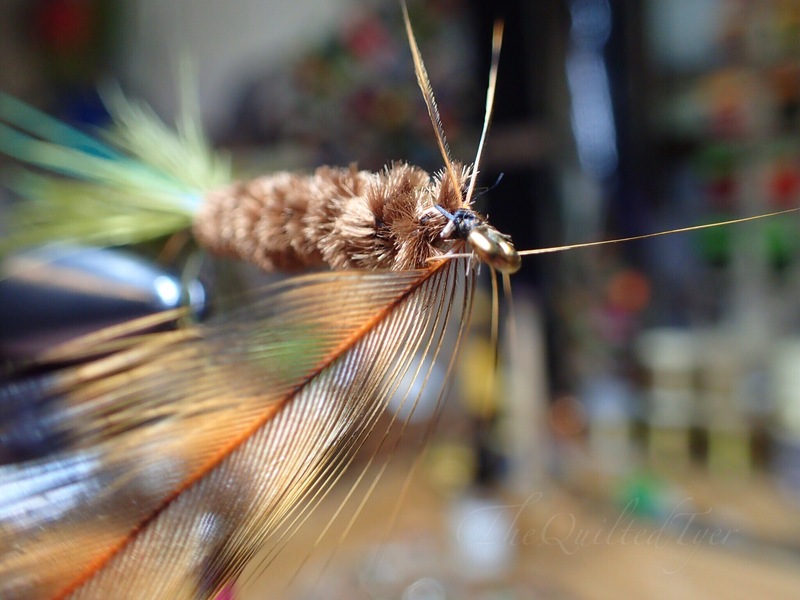 For the sake of technique, we will tie in the style of the Low Water Woolly Bugger and now advance your thread to the back of the hook shank. After cutting and covering that stem piece, you can bring your thread to the back. Do so in evenly spaced turns, about 5 or 6, stopping at the base of the tail. Take 5 or 6 evenly spaced turns towards the hook bend, and leave your bobbin hanging there. The hackle will follow this ‘road’ when you wrap it back. Here’s the fun part! We will now palmer the hackle! “Palmering” is a term for covering the majority of a flies body with hackle, instead of only wrapping the front of a fly. 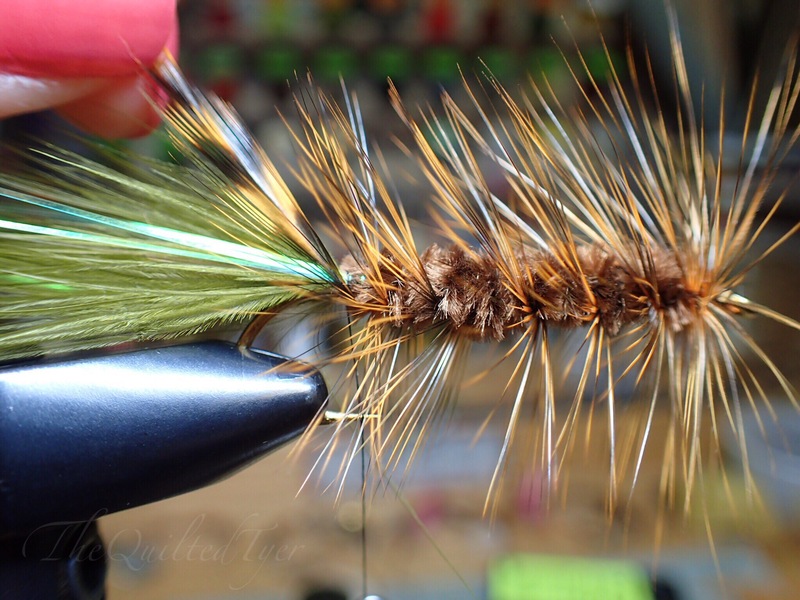 Using your hackle pliers or your fingers, begin wrapping the hackle. 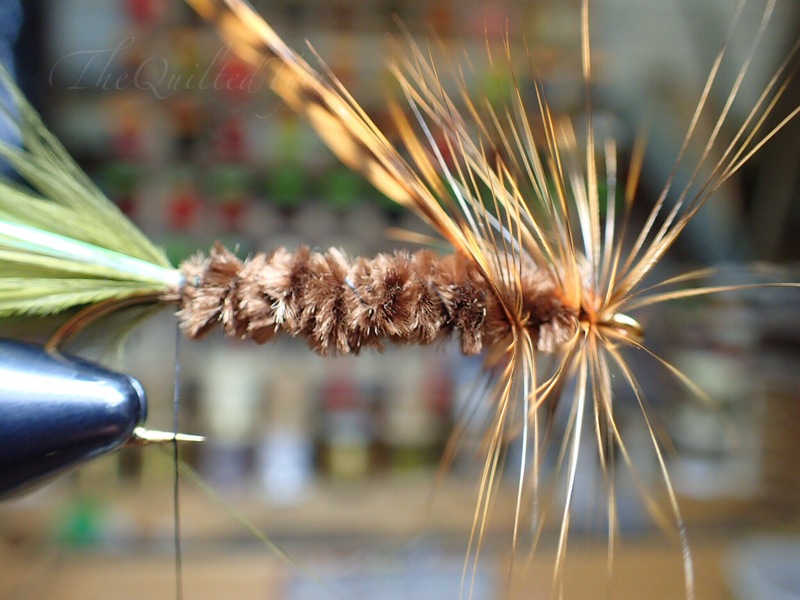 You want to wrap the hackle away from you over the hook, then towards you under the hook. You will repeat this all the way to the bend. Take two turns behind the eye of the hook, leaving room for the head. Once you have taken two touching turns behind hook eye, begin to advance your thread towards the bend. Remember that thread ‘road’ you created? Well.. now all you have to do is follow the path you had already laid with the thread when you brought it towards the back! Once you reach where you left the thread hanging you can tie the hackle off. If your hackle slips a little bit don’t worry about it, as you can see here in the photo above mine had done just that, so what I did was back up, fix it and then continue. 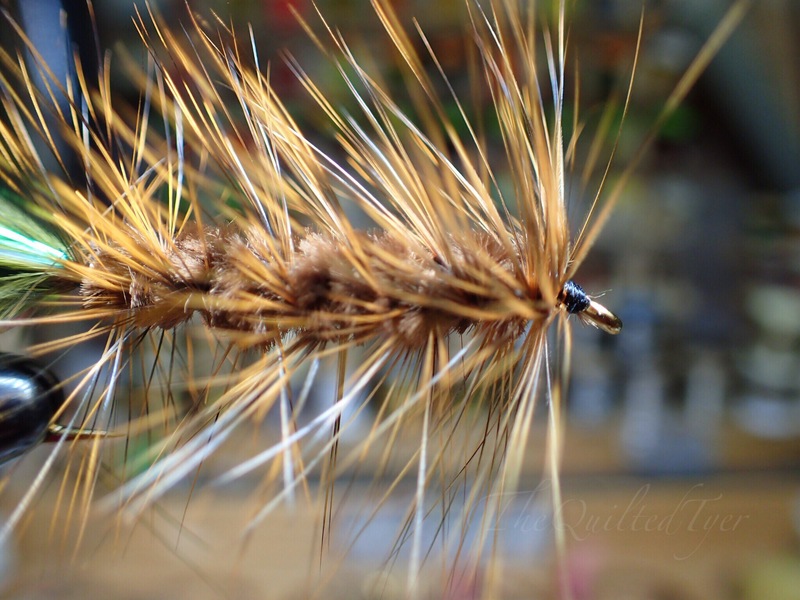 This technique you will use on dry flies as well, and is used to secure the hackle without matting it down. 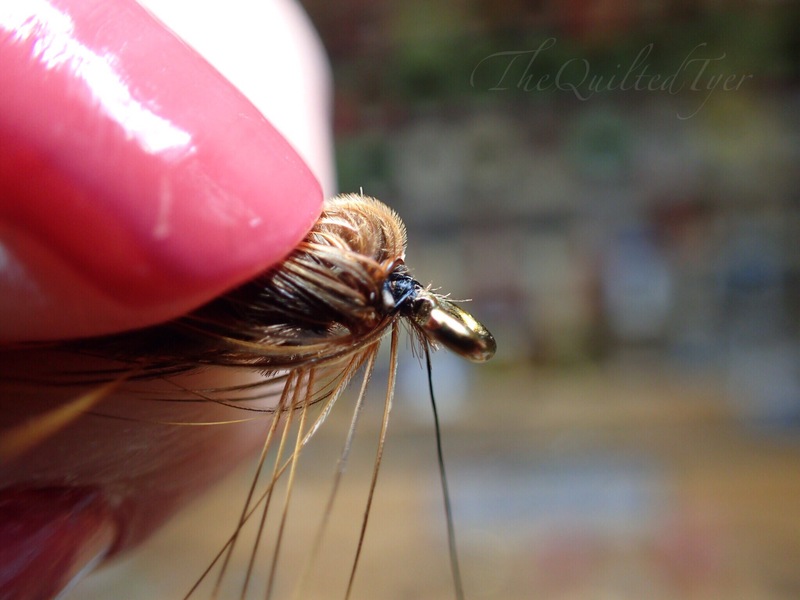 Once your hackle is tied off, you will need to get your thread back to the front of the hook. If you were to do it with haste, your fibers would be matted and ruined. You can avoid this by carefully wiggling your thread through it like a cactus, in evenly spaced turns back to the eye. You dont want to mat down those fibers, so what you need to do is wiggle the thread as you advance. This seems like a hugeeeeee pain at first, but then you will find after a few of these, that it gets alot easier. You will find you are doing it without second guessing yourself. Now brush those fibers back and begin to make a thread head. Take a quick look over at your fly, then cut off the thread. I hope this tutorial has helped those of you having trouble and as always, feel free to comment with any questions and I will do my best to help.